Dave Hutchinson, according to his enjoyable blog The Automatic Cat, began this most engrossing series of novels as not much more than a side hobby to his other work, but it strikes me as appropriate to a story that reveals more and more complexity as we learn of hidden worlds, fragmented universes, doubled identities and conspiracies. This third novel, published this week after Europe In Autumn and Europe At Midnight, plunges the reader ever further into Hutchinson's astonishing imaginative feat. What was initially frustrating as this one drew to a close, however, was how much more I felt I didn't understand; what for me is his finest achievement is how enjoyable his dance with our confusion is, for that frustration was neatly spun into excited anticipation for the next instalment by the closing pages. To explain the plot, or even the concept, of this book is something of a fool's errand, unless one wanted to, as one of the more Cold War-esque characters might say, 'spill the beans'. In short summary, however, the world as you and I understand it has been revolutionised by the discovery of hidden worlds. Not alternative dimensions, as such, but fully artificially-created worlds lying alongside our own, like two maps overlapping. This secret has been kept for nearly two centuries whilst Europe has become a dangerous parody of its current state (Hutchinson himself has marvelled bitterly at how life is starting to imitate his art), splintered into ridiculously-small independent states, the EU as we know it essentially disintegrated and an ominously-secretive and private train line sliced across it. Both previous novels revealed this world and the 'Community' and 'Campus' worlds that lie beyond, and also the players such as Rudi, the hero of the first book and our key protagonist here. It's a welcome return to the fore for Rudi, a wry and suitably-pessimistic cook-turned-spy, but I was relieved that Rupert, Midnight's main character, is now essentially Rudi's partner-in-espionage, as (at least until Winter settles into my mind more comfortably) his traumatic and disjointed journey in book two had been my favourite part of the series. They, along with Seth and Gwen, zip around Europe and beyond and eventually reveal a conspiracy of control that combines criminality and politics better than the current US election. One of the greatest elements of these books and particularly this one is how Hutchinson manages to juggle multiple narratives across space and time, and allow the reader to return to each character gently and with the breathing space needed for these jumps in perspective. Occasionally, I found the leaps a little exhausting and craved a more singular journey of self, but like any good journey the next destination revived my energy and hunger for more discovery. One way in which the author manages this is in his descriptive prose, which doesn't tire on a Dickens or Clancy level of detail but gives just enough colour and background to enlighten the mind's eye as Rudi meets another stranger or we encounter another character in another town. To describe any more than this would spoil not just this excellent, disturbing, intelligent, daft and wonderful book but of course the previous two for those unfortunate enough to not read them yet. So my shortest review in a while is nevertheless the most certain in its conclusion : Read. This. Now. ...well, not if you haven't read the first two. Read them first, then this. Please. Thank you. Bonuses: +1 for the either very coincidental or unusually prescient mirroring of real life Europe at the moment; +1 for superbly researched use of places all overt the continent, including a finale in a pathway not four minutes walk from my home! 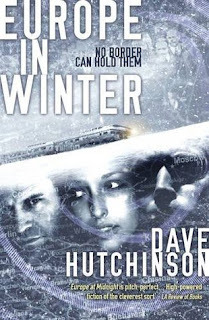 Penalties: -1 sometimes, only sometimes, Hutchinson's wild journeys of multiple characters, times and places are a bit of a jolt to move between, but this discomfort is eased by the ultimate sewing together of (most) threads. POSTED BY: English Scribbler , embarrassed Brit and guilty European and NOAF contributor since 2013.